This is an ULTIMATE 1951 Mint State Franklin set in MS 66 FBL condition! The P, D, and S mints are ALL in MS 66 FBL and BLAST WHITE to come together in this extremely rare trifecta! Each example is also an EVEREST: one of the finest examples to obtain for its year and mint that offers exceptional eye-appeal and quality. 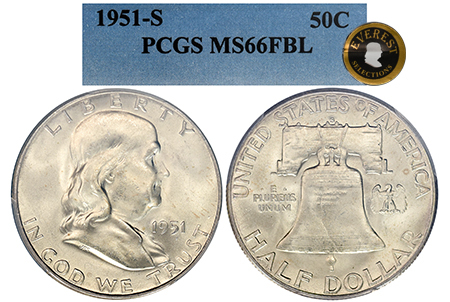 The 1951-P, with just 177 graded, is incredibly lustrous with blast-white surfaces, well defined features from the strike, and heavily etched full bell lines on the reverse. There are practically no bag marks on this example, with no major blemishes distracting from the eye-appeal. On the obverse along "Liberty”, a very thin line of gold can be seen at the very edge of the rim. VERY rare in this near-flawless, blazing condition! 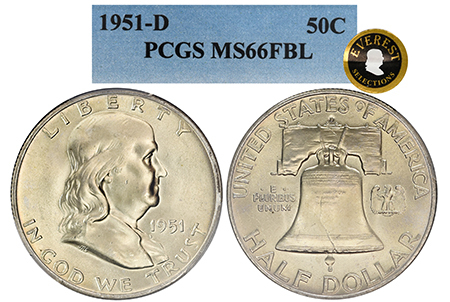 The 1951-D, ONLY 137 GRADED, is extremely elusive- particularly in lustrous, tone-free condition! A blazing Mint State, this 1951-D practically glows with its blast-white eye-appeal! Near Proof-like details in the hair and bell lines that are clear as day. Nominal blemishes, there are no heavy distractions from this practically GLOWING blazer! The 1951-S, just 164 graded, is a KNOCKOUT!!!! Blast-white, tone-free and BLAZING with luster!! S Mint Franklins are typically known for their weak steak and thus ill-defined features. The 1951-S shows even the fine details in the hair, and every millimeter of the bell lines can be seen. Stunning eye-appeal in both condition and lustrous good looks. This is a KNOCKOUT 1951-S!! 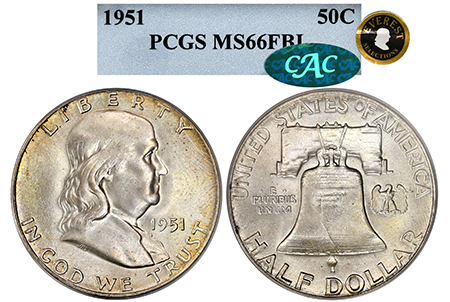 All 3 of these Franklins check the marks on BLAST-WHITE eye-appeal, high conditional quality even for the MS 66 FBL grade, strong and clear bell lines, and most of all…. RARITY!!! This a MONSTER SET that oozes "EVEREST” quality in every sense of the word!